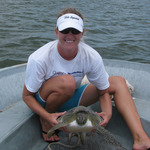 I have been working in the sea turtle research field since 2002. My interests lie in population biology, nesting behavior, anthropogenic sources of population decline, movement and tracking, auditory abilities and acoustic monitoring. I have been passionate about leatherback conservation and research since my first experience as an intern in Juno Beach, FL. One year later - so much gratitude! You put us over the top! Many, many thanks! Barbara, words can't thank you enough! You've always been such a huge supporter. Thank you from the bottom of our hearts! Thank you so much for the support! And we would love to share more about our research! It happened! Thanks to each and every one of you! Thank you, Nikki! Good question. Our long-term mark-recapture project is focused on leatherbacks. However, we do have several other projects with multiple collaborators that study loggerhead and green sea turtles. Thank you so much! We appreciate all of your support! Thank you! You can't help but love them! Thanks so much, Brandon! We appreciate it. Thank you! Thank you! We are so excited too! Thank you so much! And thanks to Nikki for keeping the word out there!